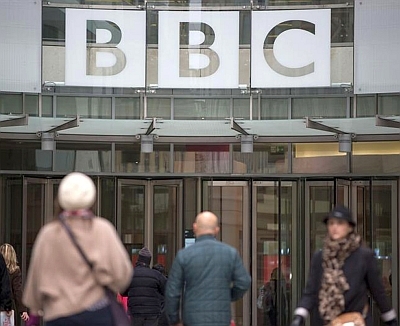 The British Broadcasting Corporation has come under fire after one of its editors allegedly compared a British Muslim radical preacher to Mahatma Gandhi, Nelson Mandela and Winston Churchill. The news corporation's Home Affairs editor Mark Easton triggered reactions on social media after he made a reference to Anjem Choudhary, referred to as "hate preacher" in the United Kingdom, and the Indian independence leader during an analysis of a new anti-terror Bill planned by the UK government. "It's one thing to ban someone for inciting hatred or violence, but quite another to pass a law that silences anyone who challenges established values," Easton said during a special report on the channel's 'News at 10' on Wednesday night. "I was in Parliament Square today -- a statue of Gandhi looking down at me who was jailed for being extremist; Mandela who was jailed for being an extremist. History tells us that extreme views are sometimes needed to challenge very established values that people at the time hold so dear," he said. The report led to comments on Twitter and Facebook with some viewers objecting to the reference of freedom fighters in the same breath as a radical with extremist views. The BBC, however, stressed that there was no comparison being drawn between the iconic leaders and Choudhary, who was the head of now-banned Islamist groups Al Muhajiroun and Islam4UK group. A BBC statement said: "The news story reflected the deep concerns over Choudhary and the extent of his influence and Mark Easton reiterated that point in his live broadcast. "He then made a wider point that the definition of extremism can change over time. He was not suggesting that the views of Anjem Choudary will be thought of differently in the future and we believe this was clear to the viewer." British Prime Minister David Cameron had announced plans for new laws by the government that will confront "poisonous Islamist extremist ideology" on Wednesday. New powers will include banning orders for extremist organisations even if they do not break the law and "Extremism Disruption Orders" to restrict the movements of people who attempt to radicalise young people. Mosques or other premises where it is found that extremists are seeking to influence people could also be closed.